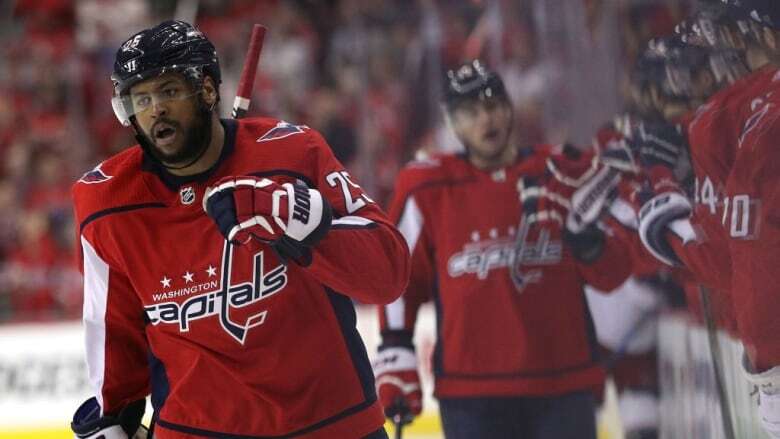 Count out Devante Smith-Pelly if the Washington Capitals win the Stanley Cup and are invited to the White House to celebrate with President Donald Trump. "The things that he spews are straight-up racist and sexist," Canada's Postmedia quoted Smith-Pelly as saying Wednesday as the Capitals prepared for Game 5 against the Vegas Golden Knights. "Some of the things he's said are pretty gross. I'm not too into politics, so I don't know all his other views, but his rhetoric I definitely don't agree with. It hasn't come up here, but I think I already have my mind made up." Smith-Pelly, one of two black Capitals players, is from the Toronto area. He spoke two days after Trump cancelled the Super Bowl champion Philadelphia Eagles' visit to the White House, and a day after NBA stars LeBron James and Curry both said they wouldn't visit. The Capitals lead the best-of-seven series 3-1, and can hoist the Cup on Thursday night. The 25-year-old Smith-Pelly has scored in the last two games of the finals and had six goals — two of them winners — and an assist in the playoffs. He had seven goals in 75 games in the regular season.